Ride-hailing company Ola has raised Rs 520.79 crore ($74 million) in a funding round from Hong Kong-based hedge fund Steadview Capital, an existing investor in the Bengaluru-based company. This raises Ola’s valuation to $5.74 billion from $4.45 billion in October 2017, sources said. A marked increase as compared to an estimated valuation of close to $4.4 billion when it raised the earlier large round from Chinese internet giant Tencent, in October 2017. Sources said the new funding is formally part of that same latter round, when the company had raised $1.1 billion led by Tencent, with participation from Japan’s SoftBank (also an existing investor) and other new US-based financial investors. The company had then said it was also in advanced talks with other investors to close an additional $1 billion as part of the financing round, concluding a total raise of a little over $2 billion. In recent months, the company has been raising funds in smaller tranches. The new funding is expected to help the Bhavish Aggarwal-led company to intensify its battle with global rival Uber in the Indian market. Uber has been gaining market share, apart from expanding into global markets. According to regulatory filings made by Ola (sourced from business intelligence platform Paper.vc), 245,082 fully and compulsorily convertible, cumulative ‘Series J’ preference shares’, having a face value of Rs 10 each, have been allotted to Steadview Capital at a subscription price of Rs 21,250. “This funding appears to be part of a new Series J round. With the Steadview funding alone, the post-money valuation of Ola now stands at $5.74 billion,” said Vivek Durai, founder of Paper.vc. This latest funding comes when Ola is expanding its operations in India and abroad, including in Britain, Australia and New Zealand. The firm is also building an online food delivery business through Foodpanda’s India business, which it acquired from Germany-based Delivery Hero Group in December 2017. Ola committed an investment of $200 million into Foodpanda India, and is competing with Uber Eats and Swiggy in this space, while burning a lot of cash in the process, with rising competition. Last September, new investors Hong Kong-based Sailing Capital and China-Eurasia Economic Cooperation Fund also invested $50 mn in Ola. 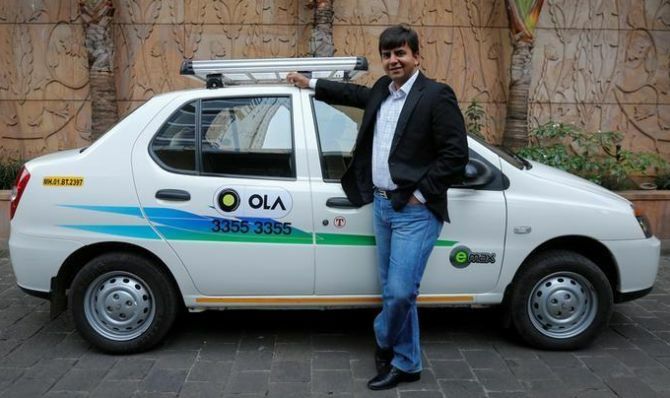 Ola was founded in 2011 by Bhavish Aggarwal and Ankit Bhati. It is said to have a presence in 125 cities across the world, connecting over a million “driver partners”. The company is currently learnt to be witnessing 2.5 million rides a day in India from its platform, both taxis and auto-rickshaws. As it diversifies into newer segments, Ola has announced a strategic investment into Vogo, a scooter sharing start-up. This is intended to help it address short-distance transport and embracing motorcycle-sharing firms. As part of this, the company has said it would boost Vogo’s supply by investing in 100,000 scooters on the latter's platform, worth around $100 mn.